Farmers across Alberta are dealing with elk and deer feeding on and fouling their winter feed stacks, bale yard, swath grazing and other feed supply. To find solutions for these serious problems, we have initiated two 3D fencing project sites in the Sundre area of Mountain View County. We located two cooperators in the Sundre area that were having significant elk damage to their winter hay supplies. Both Otto and Darryl agreed to be cooperators for the project. GWFA staff with the help of our cooperators, Otto and Darryl, built the fences around the bale yards at the two locations. Fence construction consisted of a 4 wire, high tensile electric fence about 4 feet high. An additional one wire fence was built outside of that, 3 feet from the 4 wire fence and 3 feet high. Gates were built to have the same configuration. Once the fences and gates were built, fence energizers and ground fields were installed. We also flagged the fence and attached foil cups with scents to attract cow elk. During the winter the sites were continually monitored, doing some occasional maintenance to the fences and keeping the elk attractant scents fresh. January 2015 a large herd of elk visited Otto’s site with half a dozen getting inside the fence. Judging by the tracks it looked like they were jumping the fence. Besides the few elk that got into Otto Seidel’s site, a few mule deer were seen inside the enclosure at Darryl Murphy’s site. The tracks showed that they went under the outside fence and over the inside fence. 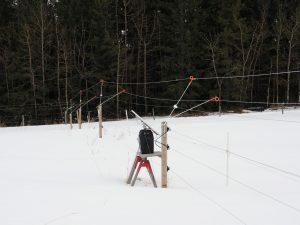 After more research a decision to modify the fences, by adding wires and flex posts to the 4-wire fence at Otto’s farm, to increase the height by 2 feet. Flex posts were also added to position a single wire into the space between the outer fence and the inner high tensile fence to give the overall fence more depth. The winter of 2015/2016 was very mild and there we little to no game pressure. The game cameras did capture a few deer in the late spring making it through the fence, but the wires had slackened through the winter and the deer could duck the outside fence and crawl through the slack wires on the main fence. Summer of 2016 maintenance was done to tighten the slackened wires and pound the flex posts that had heaved with the frost. The long grass was clipped under the wires to reduce the chance of grounding the fence. The game cameras were redeployed with a bit of elk attractant. 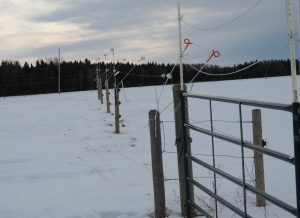 Our cooperators collected the fence voltage and weather data during winter. The game cameras were pulled at the end of March, and the pictures were reviewed. We didn’t capture any photos of deer or elk attempting to breach the fence. Otto said there was little to no deer or elk present through the winter at his location.